It goes without saying that spending all your days sitting in front of a desk is extremely bad for your health. Most of us have to experience this problem because most jobs require sitting at a desk for long periods of time. Of course, you will get to move around the office and even go out during lunch break, but it still isn’t sufficient to make up for the hours you have already spent slouching over the desk. This is how standing desks were introduced and rapidly became a hot item in work places. Halter ED-258 Preassembled Height Adjustable Sit / Stand Elevating Desktop is versatile and gives a lot of flexibility to users. 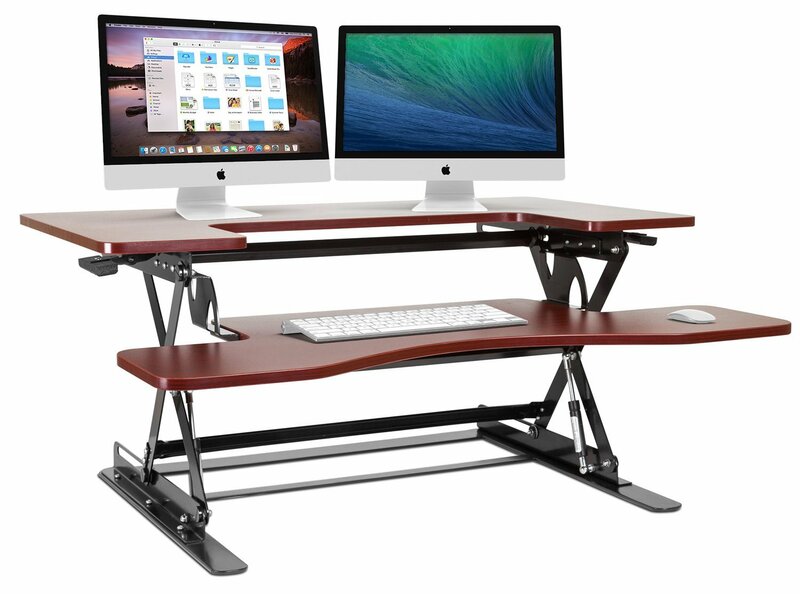 It goes on top of your current desk and the two-tiered design adjusts and fits according to the position that is most comfortable for you. The Halter ED-258 is an adjustable stand/sit elevating desktop that comes preassembled in the box. The design aims to solve your posture, neck, circulation and back issues. It ensures maximum comfort by giving you different levels of desktop heights to work on. In some cases, your eye strain is also reduced by using this desk. Studies have time and time proven again that by simply standing up and flexing your muscles, many side effects of a sedentary job can be eliminated. The Halter ED-258 Height Adjustable Desktop is fully assembled and is placed on top of your workstation. The surface area is 35.6 inches wide, which is plenty of space to place up to two monitors on it, with extra room still remaining for extra accessories. The maximum load the desktop can support is around 44.1 pounds. To lessen the clutter on top of the desk, the keyboard tray is also 35.6 inches wide so that the keyboard, mouse and all your other portable devices can be placed on the tray without limiting space on the desk. The height of the desktop is adjusted by squeezing the two handles located on the side of the product and applying pressure to lower or raise the desk. It extends up to a height of 16.14 inches, so you can choose the fit that best accommodates your sitting or standing posture. 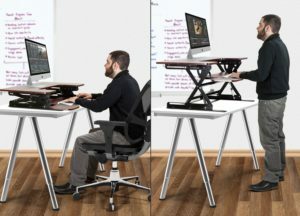 No matter how much you extend it upwards, the surfaces will remain stable just like a regular desk except that you will be able to switch from sitting to a standing position and vice versa in seconds. The desktop is durable and sturdy because it has a high quality construction using the best materials. The up and down movements are extremely smooth and won’t cause you any injuries. The box comes with one Halter ED-258 Height Adjustable Desktop and a 1-year limited warranty. The price has almost halved currently, making this a fantastic bargain. Standing Desktop Desks are all the rage nowadays and beneficial for anyone who uses them. For more options, read our other reviews on Standing Desktops.